The beauty of Sardinia is now indisputable when it comes to white beaches and beautiful sea. But there is something that escapes many, a real jewel accessible by sea and is the backdrop located in the south of Sardinia, specifically in front of Falkensteiner Resort Capo Boi in Villasimus. Rare bivalve species, sea sponges, squid mureins, caves, canyons and Roman galleys, make those waters a true paradise for diving. The underwater legend Christian Redl is aware of these magical waters and describes in this video the emotion of exploring these waters that are full of life and colours. 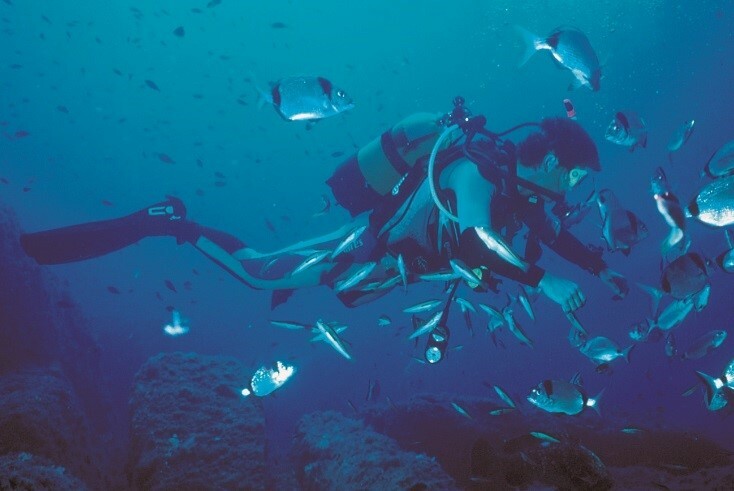 Christian Redl is not only a scuba diver in love with Sardinia and this particular place but he is also an expert who accompanies all those who want to embark on the exciting adventure and to dive in the waters of Capo Boi. Because Christian accompanies beginners and advanced divers; in addition to explaining the techniques of diving, he will show you how to explore caves, ravines and wrecks as well as where to find the famous Gorgonian corals. The sub-aqueous activities at Capo Boi can be at different levels, the easiest being snorkeling in the crystal clear water. But for the more adventurous, Redl supplies you with cylinders and all the necessary equipment for an unforgettable experience. If all this seems magnificent and you also want to experience the thrill of diving in the waters of Capo Boi click here to read more about the resort. At Sardatur Holidays we prepare holiday packages for 7 nights but we also organise tailor-made package holidays with include accommodation, flights and transfers. Our goal as a tour operator is to make each and every person’s holiday unique.